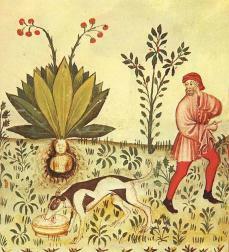 Alraune, Man-Dragon, Crown of Hell, Babe of the Gallows–few plants share as much lore and hold such awe for the Witch as the mandragora. 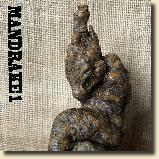 Rooted in this rich landscape of tradition, each hand sculpted Mandrake Fetish has a ritual charge of mandrake root and leaf (with flower added to the females), and many other ingredients drawing from traditional mandrake lore (including serpent and human ingredients, and empowered with certain ritually collected dirts). 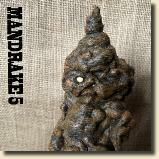 Each ritual charge was also buried with a live mandrake before being interred in their current clay-wrought form. 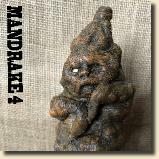 They are painted with a mixture that has human bone and mandrake leaf, and also includes dirt from live mandrakes as well, and their basal crown has an additional ritual charge allowing a feeding potential of benefit to both Witch and Root. The human bone used in each paint mixture is from the same male or female skull used to make each gendered charge. 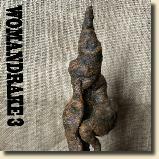 Each sculpted radix manifests through the artist's hands in tandem with the indwelling numenous desire to differentiate. 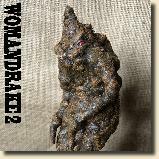 A handful of drakes will also have animal components and connections, playing on the intersection of Root and Familiar, and it is in those witch animals such as cat, toad and rabbit that those Roots may also emerge. They are approximately 6.5 to 14 inches long (16-35cm). 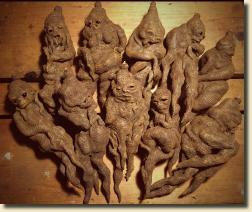 Each Drake has its own particular propensities for drawing or commanding the spirits of the dead, as well as traditional ascriptions for love and protection magic especially.. As sculpted bodies intended for working mandragora apart from wet-nursing or harvesting a wild-root oneself, the Reddening of the Root, a month long ritual is included, along with a powder meant to assist in feeding the radix when ritual suggestions are taken into consideration. 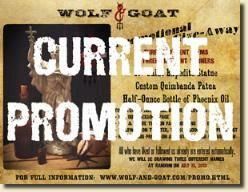 This Rite, based in Iberian and British traditions surrounding the Root, allows the feeding of each unique angelus or daemon that will inhabit the Fetish in accord and pact with the greater Numen. 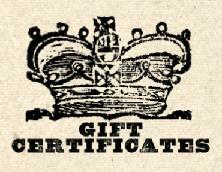 It is traditional that opposite gendered pairings are a most secure fit, although follow one's instinct in consideration of all nuances here. 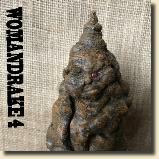 It may be that the unique manifestation of the Mandrake in a particular sculpted radix is calls more, regardless of gender or ascription of quality. As the bond will be fought for and near permanent once performed correctly, choose your Root wisely. While these depictions may resemble children of Men and appeal to many as such, remember too that these are still Dragon, and a warning is given to avoid infantilizing them, lest the Serpent reveal itself in spite of comfort. 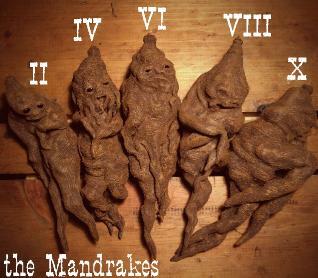 Each Mandrake will come with a feeding powder whose uses are detailed in an accompanying cloth scroll, which will include a Rite of Reddening the Root, used for the calling and bonding with each Fetish. 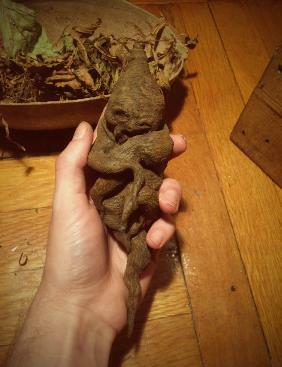 While the complete array of possibility with a Mandrake Fetish is limited somewhere in the intersection between ingenuity, the expressions of the numen of the Root itself, and the corporation of Spirit, we are happy at this time to offer the above available fetishes. 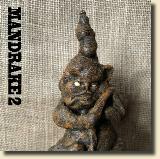 The lore of the mandragora is vast and part of both living tradition and inspired revival. 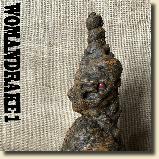 For those who wish to engage a growing Root in this Work, we highly encourage keeping a watchful eye on Harold Roth's webstore Alchemy Works and Alchemy Works on Facebook. 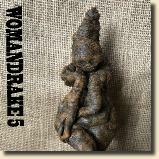 He periodically offers live and dried black and white mandrake roots, and the seeds of both are usually available. His knowledge of mandrake care and advice both onsite and in private communication has proven invaluable in keeping our own Roots thriving. From Hand comes Form, from Form the Blood, from Blood the Pact, from Pact the Breath, from Breath the Scream, from Scream the Hand Reborn.